As a result of Hoyer and Danfoss Drives working together, a solution was devised for their shared client that was easy to assemble and configure. Hoyer recently received a quite specific request: a customer wanted to mount a VLT® DriveMotor FCP 106 frequency converter from Danfoss directly onto a motor in their conveyor system. As a result of this challenge, the joint effort ensured a solution that has made life easier for the customer after Hoyer and Danfoss’ idea streamlined the process. “We already had a long-standing close partnership with the customer for the supply of standard motors. With respect to the new challenge, we suggested going straight to Danfoss Drives to engineer a tailor-made solution,” says Claus Balle Thomsen, Key Account Manager at Hoyer. Hoyer contacted Danfoss Drives with their idea and found a positive response. The approach was to modify a standard 7.5 kW electric motor by fitting an adapter plate, so that a Danfoss VLT® DriveMotor FCP 106 frequency converter could be mounted as a plug-and-play solution via a connector. In practice, this meant that the converter could be ‘clicked’ into place on to the motor. The partnership allowed Hoyer and Danfoss Drives to focus on their respective strengths. “At Danfoss Drives, we are specialists in frequency converters – whilst Hoyer are experts in motors. Combining our knowledge allowed us to find a cost-effective solution for the customer. We sent our adapter plates to Hoyer’s workshop, where they were mounted on the motors. It is a practical solution that suits applications such as ventilation systems, pumps and conveyors where there is no violent shaking of machinery, or an aggressive environment” says Asbjørn Jonassen, Key Account Manager at Danfoss Drives. With the adapter plate already in place when the motor is delivered, it is a simple matter for the customer’s technicians to mount the frequency converter and set the speed via a computer. “In the specific case, Hoyer takes responsibility for design and modification of the motors, so that they can quickly and easily match the Danfoss VLT® frequency converters. Other customers may also benefit from the logistical setup: we can offer them the total solution as a framework order, for instance. 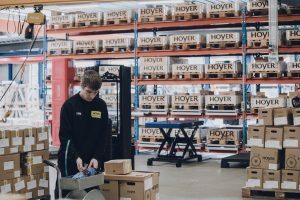 What this achieves is flexibility – our customers can continue to use Hoyer motors whilst also incorporating their preferred type of frequency converters,” says Claus Balle Thomsen. A frequency converter allows you to regulate the speed on an electric motor, which normally has a fixed number of revolutions. Frequency converters are often used to reduce energy consumption. For instance on a pump when it does not need to be working at maximum capacity. They allow a reduction in speed and hence in power consumption. 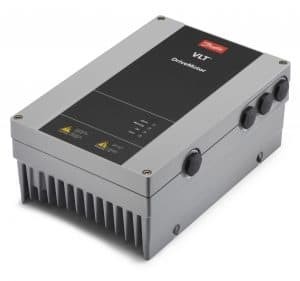 Frequency converters are used in all sectors and in a wide variety of applications such as conveyor and ventilation systems, pumps and winches.